One of a number of native trees that is making an impact with landscapers is Waterhousea floribunda. Used both for hedging as well as being a useful small to medium sized shade tree. Waterhousea floribunda ‘Weeping Lily Pilly’ trees will grow to 15m however they can easily be kept to 4-5m with regular pruning. 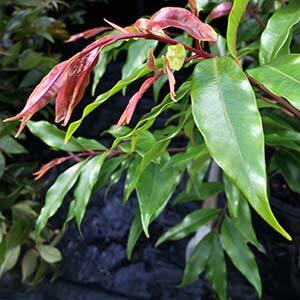 A medium growing native rainforest tree with pendulous or weeping foliage Waterhousea floribunda makes a nice specimen tree and is also suited for use as an informal hedging plant or screen. Clusters of white flowers in Summer this is a reasonably fast growing tree with a root system that is not invasive. It will reach 8m plus however it can be easily pruned to maintain size. Growth rate is regarded as medium to fast and will be improved with adequate water and some fertilizer. Waterhousea floribunda with its pendulous foliage makes an attractive tree for use in the garden or for general landscaping purposes. Useful as a screening tree or tall hedge reaching 10m plus and with a nice dense foliage and a weeping habit it is excellent for this purpose. Easily pruned to keep it to a lower height and with the advantage of having foliage right down the trunk it can make a complete screen. Wholesale Nurseries, Tube Stock and advanced specimens for sale. Waterhousea floribunda is available for sale from the following participating nurseries.